Diaspore banks are crucial for the maintenance and resilience of plant communities, but diaspore banks of bryophytes remain poorly known, especially from tropical ecosystems. This is the first study to focus on the role of diaspore banks of bryophytes in tropical rain forests. Our aim was to test whether microhabitat (substrate type) and species traits (breeding system, phylum) are important in explaining the diaspore bank composition. Using samples cultivated in the laboratory, we assessed the number of species and shoots emerging from bark, decaying wood and soil from two sites of the Atlantic rain forest (montane and sea level) in Brazil by comparing the contribution of species by phylum (mosses, liverworts) and breeding system (monoicous, dioicous). More species emerged from bark (68) and decaying wood (55) than from soil (22). Similar numbers of species were found at both sites. Mosses were more numerous in terms of number of species and shoots, and monoicous species dominated over dioicous species. Substrate pH had only weak effects on shoot emergence. Species commonly producing sporophytes and gemmae had a high contribution to the diaspore banks. These superficial diaspore banks represented the extant vegetation rather well, but held more monoicous species (probably short-lived species) compared to dioicous ones. 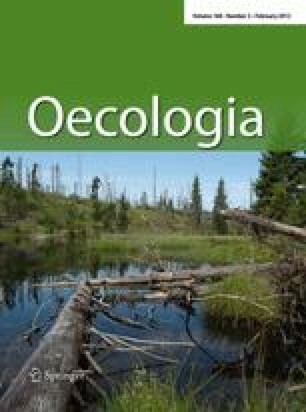 We propose that diaspore bank dynamics are driven by species traits and microhabitat characteristics, and that short-term diaspore banks of bryophytes in tropical rain forests contribute to fast (re)establishment of species after disturbances and during succession, particularly dioicous mosses investing in asexual reproduction and monoicous mosses investing in sexual reproduction. The online version of this article (doi: 10.1007/s00442-011-2100-3) contains supplementary material, which is available to authorized users. This research was supported by the Coordenação de Aperfeiçoamento de Pessoal de Nível Superior (Capes), the Conselho Nacional de Pesquisa e Tecnologia (CNPq), and the State of São Paulo Research Foundation (FAPESP) as part of the Thematic Project Functional Gradient (Process Number 03/1259507), within the BIOTA/FAPESP Program––The Biodiversity Virtual Institute (http://www.biota.org.br). COTEC/IF 41.065/2005 and IBAMA/CGEN 093/2005 permits collect. We are grateful to Jan-Peter Frahm, William Buck, Thais F. Vaz-Imbassahy and Nivea D. Santos for help with identification, verification and information about species, and to Adalberto J. Santos and Luciano Pereira for help in the field and laboratory. Sincere thanks to Takashi Muraoka (Laboratório de Fertilidade do Solo, CENA-USP) for nutrient analyses. We thank Heinjo During and Sebastian Sundberg for helpful comments on the manuscript, and Scott Spellerberg for revising the English.